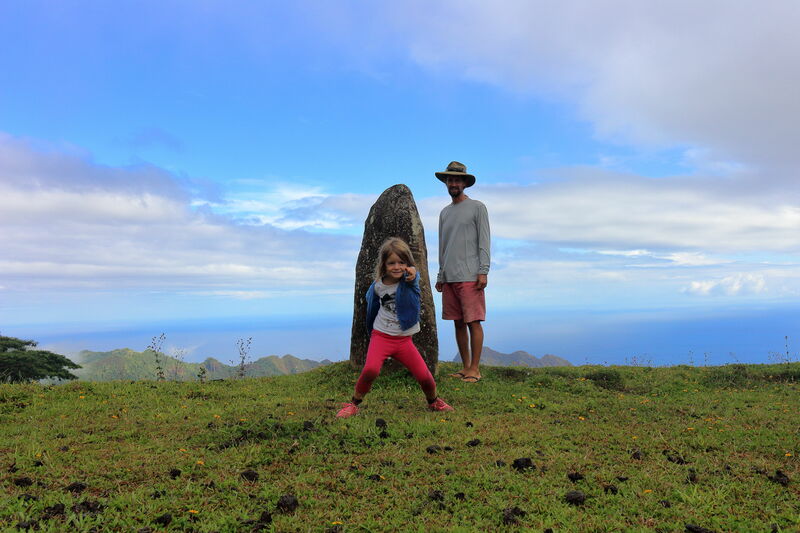 Alex mentioned in his last blog post that we’d been terrible tourists over the past few months due to the fact that we’d spent many of our days on Bob and not explored the sites of Nuku Hiva. I think this statement is a little unfair, given that Alex was doing a fair bit of boat work and I spent many hours a day finishing my statistical work for the research station in Galapagos. Which, I’m very pleased to report after all this time, is now finally finished! 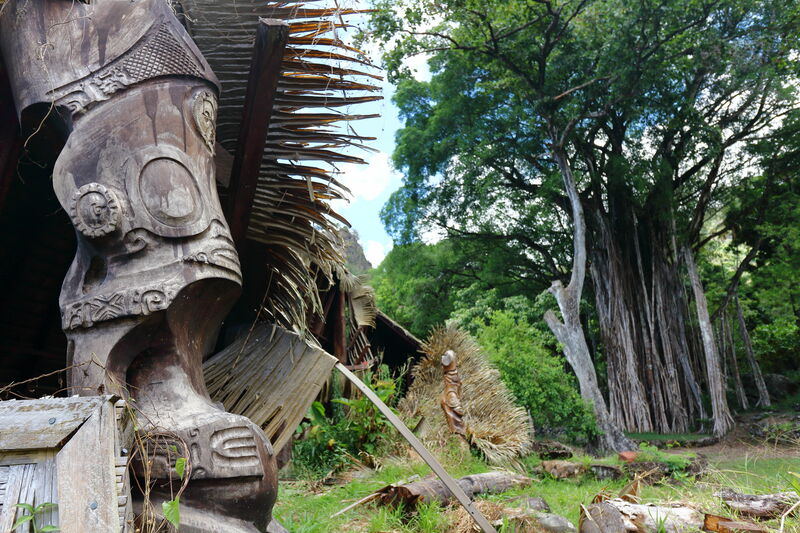 Even though our time in Nuku Hiva was largely spent doing productive jobs, we still managed to find time to see the local sights. I suppose I was a slightly better tourist than Alex given that he had to cower in the shade for three weeks to protect his beautiful new tattoo from sun damage. 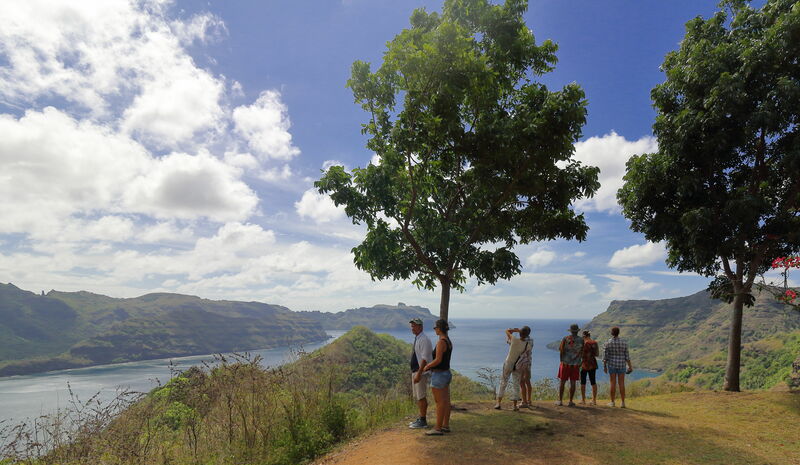 Despite this, we still found time to rent a car to see the sites around Nuku Hiva, hiked to archeological sites and various viewpoints, visited a local waterfall, sailed to another bay, did loads of snorkelling and even managed to fit in a scuba dive. In fact, I would go as far as to say that in some ways we were far better than your average tourist. 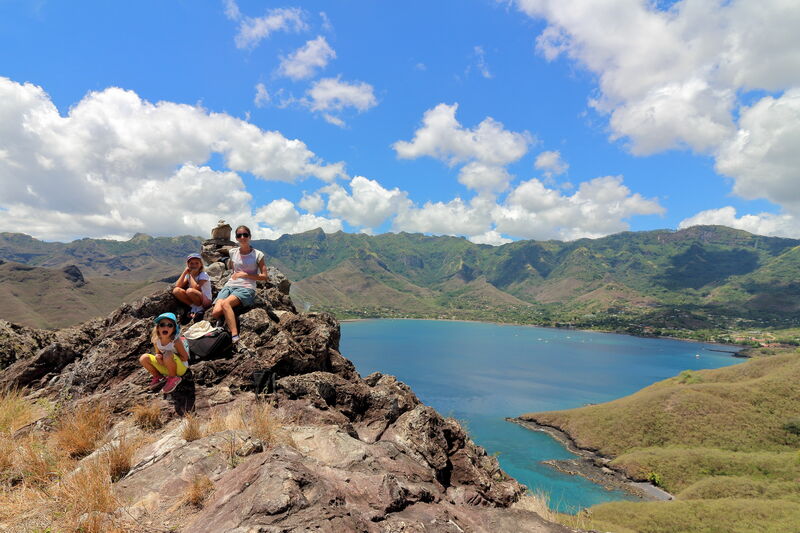 Having spent almost 6 weeks in one place, we got to know the area really well. We know all the local shops and the best times to buy cheap fruit, vegetables, wine and rum. Alex’s French has improved so much that he can now have decent two-way conversations with the locals*. 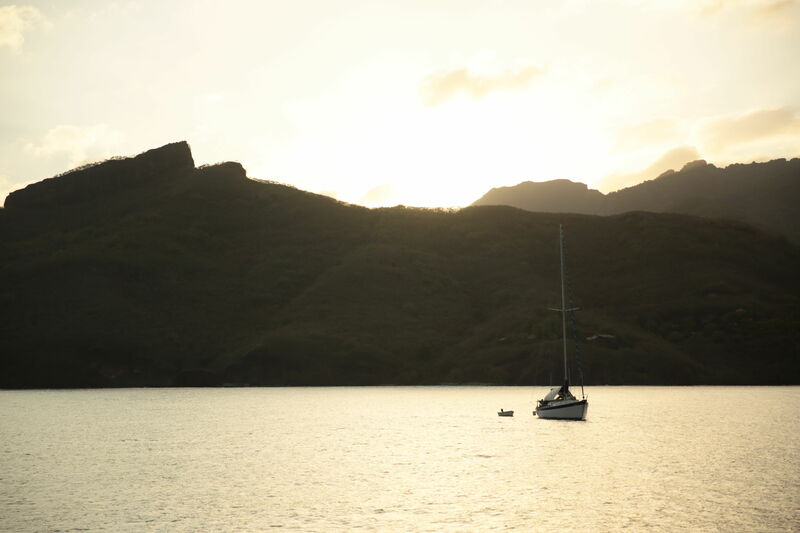 We’ve established close friendships with many of the other cruisers and now recognise numerous sailboats in and around the Marquesas. During my hike to the local waterfall, I got a little lost and had to ask a local for directions. The lady was adamant that there was no waterfall nearby and that the closest was in the next bay, a 3 hour sail away. Less than half an hour later I had found my way to the local waterfall, so you see, we got to know the place even better than the residents. Well, one of them at least. 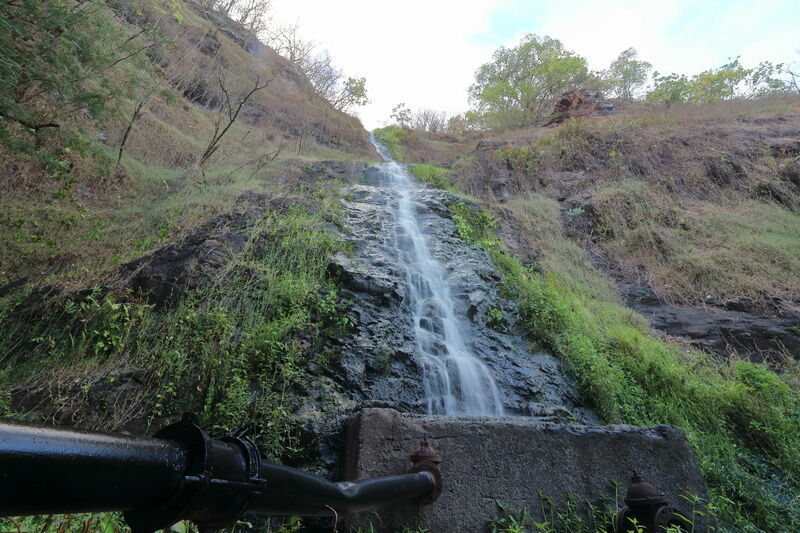 The local waterfall in Taiohae. Not the most scenic I’ve ever seen but I like how they’ve diverted the water to be utilised by local small holdings. One of the ways I got involved in the native Polynesian culture was to attend local dance classes with some of the other cruisers. For just over a month I attended classes in Polynesian dance about twice a week. I have always enjoyed dancing. In the past I have taken a few classes in seroc, salsa and ballroom; I even took regular classes in Argentine tango for about 6 months in my early twenties. Also, my grandparents were excellent dancers and spent much of their youth doing Latin and ballroom at their local dancehall. My Nana used to proudly announce that many of the other dancers preferred to learn from her and my Grandad instead of the professional and fully-trained dance teacher. 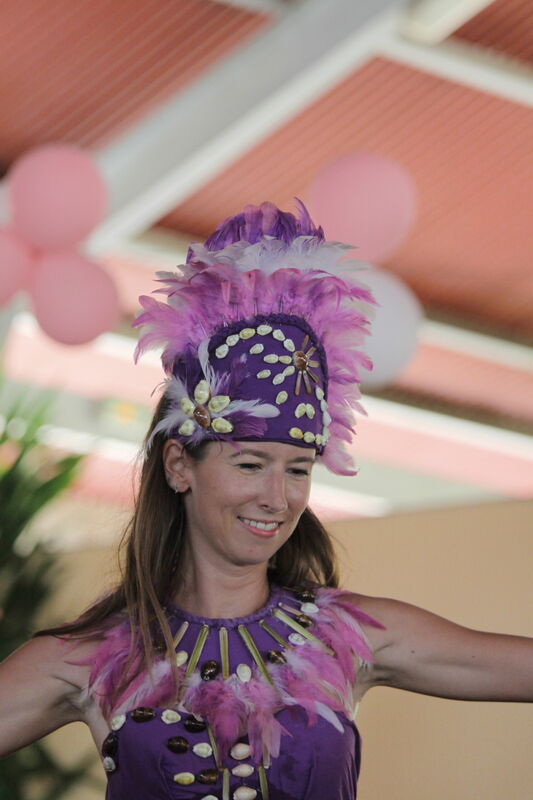 However, even with my genetics and dancing experience, the local Polynesian style is very difficult to master. Here, the idea is to jiggle your hips at the speed of light whilst keeping the rest of your body as still as rock – a little like belly dancing I suppose. This technique is not at all easy for a skinny Caucasian girl with small hips and not a whole lot of fat to ‘jiggle’ around. Still, my dancing can’t have been too terrible because (to my absolute astonishment) the other cruisers and I were asked to participate in a local performance. Anyone who knows me will understand just how much I dread doing public performances of any kind! So this request was not taken lightly, especially considering I was only asked to participate two days before the performance. On top of that, I had to learn an intricate and complicated 4-minute dance from scratch as well as perfect the one that I had already been practising. The thought of performing was putting me into a severe state of panic. I spent most of the next two days shaking in a cold sweat while doing one dance practise after another. Even during my sleep I was dreaming about the routine. I’m very happy to say that I decided to go ahead with the performance, along with 4 other sailing ladies as well as the local Polynesians. It was a truly amazing experience and a fantastic opportunity that I might never get again in my life. We performed in front of 200 paying guests to raise money for the local school. 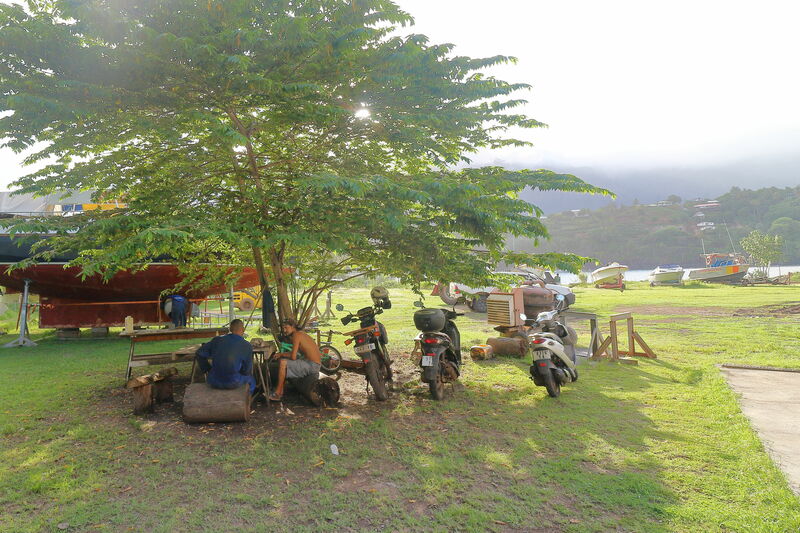 The guests enjoyed about 10 different dances by local men, women and children (I was part of two of them) as well as a local Polynesian barbeque – with pork, fish, goat and local vegetables cooked in a ground oven. Similar to the barbeques we had on Taravai in the Gambier Islands. Me during the performance dressed in locally-made dance regalia. Thank you David for such a lovely photo! The next 3 are also by him. Me and the other sailor ladies dancing with the local Polynesians during our first dance – it was a fast one! Even Kali and Gaya were able to get involved with the performance and they did their own dance with some of the local children. They were so adorable! Generally, people don’t have regrets about the things they do in their lives, the regrets people have are about what they don’t do. This performance is definitely one of the more terrifying things I’ve done, but I’m so glad I got over myself and got involved – it’s an opportunity that I would have genuinely regretted missing. After a short stop in Tahuata we’re now back in Hiva Oa waiting to haul Bob out of the water to do some work on the bottom. I hope we can get the work done as quickly as possible so we can swiftly leave. Tahauku Bay in Hiva Oa is probably my least favourite place in the Marquesas . The anchorage is pretty rolly despite having the protection of a breakwater. The river runs straight into the bay causing the water to be a disgusting brown colour with a visibility of about an inch. The dinghy dock is very sketchy and a stern anchor is needed to dock without risking destroying your dinghy. 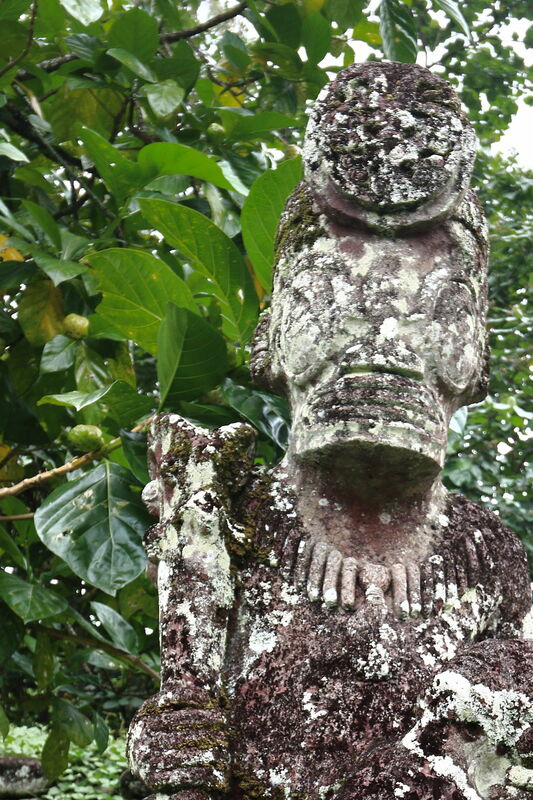 It’s an hour walk to town and the friendliness of the locals seems to be very hit or miss. However, a new boat yard has recently opened up here and it’s the only place available to haul out a sailboat within 500 miles – and certainly the only place safe from cyclones at this time of year. Maintenance Marquises Services is the new company, owned by a Frenchman and his Polynesian wife, who run this pleasant and laid back boat yard. The prices are very reasonable for French Polynesia, although we’ve been waned that they tend to add on charges for ‘extras’ which should be budgeted for if you use this boat yard. They use a modern tractor with a fancy hydraulic trailer to haul boats out of the water from a slip. As much as I would rather avoid Hiva Oa, we couldn’t miss this opportunity to do some much-needed work to Bob. And who knows, maybe I’ll be pleasantly surprised by my visit this time. 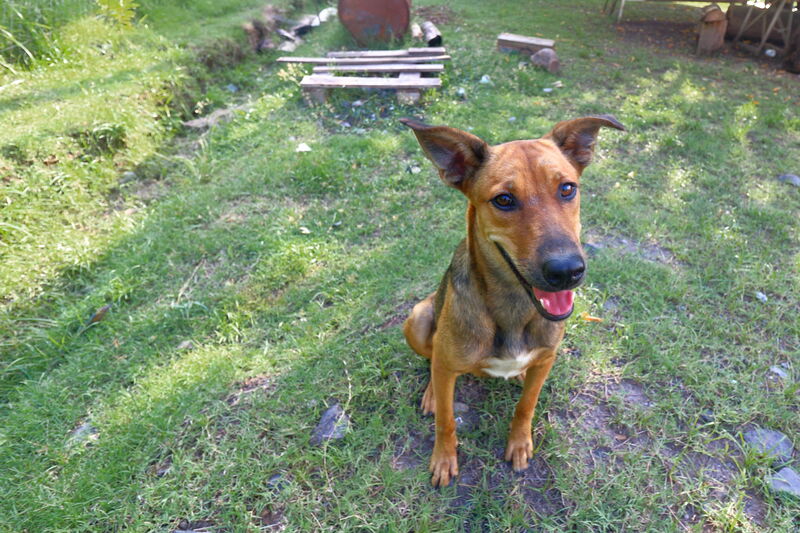 The local dog adopted by the yard – named very appropriately ‘MMS’. *Alex wishes it to be made clear that he feels this statement is entirely false and unfounded. He is merely semi-talented at smiling and nodding, thereby giving the illusion of linguistic competence. Outstanding! I believe Alex entirely about his linguistic ability – not good to my knowledge! Love the dance photos Sarah – what an experience – your comments took me back to seeing you and Kate terrified of performing at school assemblies at Worthinghead. A world away from where you are now.